Written by: Sarah J. Maas. Official synopsis: "Meet Celaena Sardothien. Beautiful. Deadly. Destined for greatness. In the dark, filthy salt mines of Endovier, an eighteen-year-old girl is serving a life sentence. She is a trained assassin, the best of her kind, but she made a fatal mistake: she got caught. Young Captain Westfall offers her a deal: her freedom in return for one huge sacrifice. Celaena must represent the prince in a to-the-death tournament—fighting the most gifted thieves and assassins in the land. Live or die, Celaena will be free. Win or lose, she is about to discover her true destiny. But will her assassin’s heart be melted?" Man! What is it with me this year being late to the party! Yikes! First it was Cassandra Clare's The Mortal Instruments series which I started last month and now it's this... Throne of Glass by Sarah J. Maas. I really do not know what has taken me so long, why it has taken me the amount of time it has to actually pick the book up. I've had a copy of this for so long, both physically and on my Kindle as I knew whenever i eventually got around to reading it it would have to be on my Kindle because there wasn't a chance on earth that I'd risk damaging my beautiful finished copy, with it's perfect white spine and stunning cover which you can see above. I also had Crown of Midnight, which I got around publication and I already had Throne of Glass so I'd been sitting on it for a year. Yikes. That is terrible. I think part of my apprehension was the hype surrounding the book. I had heard so many things, so many people, blogger friends and non-bloggers alike, that it's epic, wonderfully written and so on. I was scared that a book with such a beautiful cover might have a flaw somewhere. As Beetee said, there is always a flaw in the system. But when it comes to Throne of Glass I can throw my head back and howl with conviction that this book is flawless. It overshot my expectations big time! BIG TIME! I'd hoped it would be amazing but what unfolded before my eyes took my breath away and surprised me. The world building is incredible. I loved the way that little tidbits were revealed as the story went along. It didn't feel like everything was being shown all in one go, like one massive information dump, and I really liked that. I think world building works far better that way, I find that I remember a lot more if its given in dribs and drabs rather than in one long section. Celaena herself is an awesome character. She feels dangerous, unpredictable and untameable whilst at the same time there's this edge to her that you can tell some of it is just a front to protect herself. I liked this about her, and the fact that she is supposed to be the most dangerous assassin in all of Erilea was great, because everyone seems to be scared of her to start with even though she has been sent to the salt mines in Endovier for her crimes. We also meet Dorian, the Crown Prince of Adarlan, son of the King of Adarlan who is intent on taking over all of the kingdoms. Dorian himself is a bit more laid-back than his father. There's a cocky, arrogant and swaggy air about Dorian, himself. He's so sure of himself and isn't ashamed of his luck with the ladies. As well as Dorian we also meet Chaol, the King's guard, a fearful and authoritative figure who mistrusts Celaena and every step she takes. And rounding up our main cast, for now, is Princess Nehemia who becomes Celaena's best friend, Princess of Eyllwe and staying in the glass palace for the time being. Maas' writing is so fluid and crisp that I quickly got into a rhythm and couldn't stop reading. 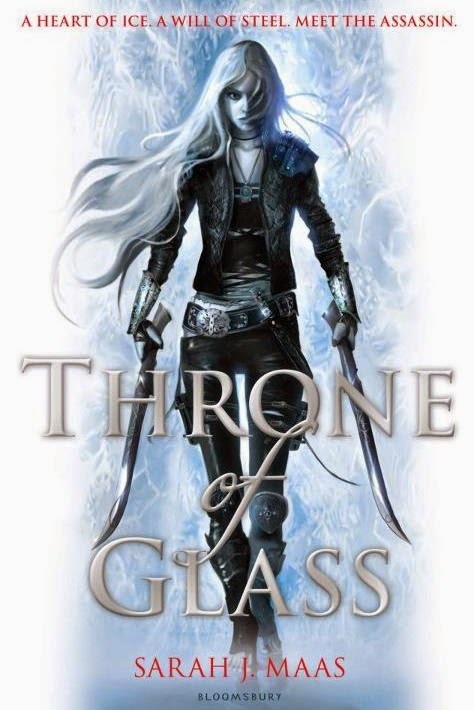 Throne of Glass is an epic blend of fantastic writing and fantastical plot that is brilliantly executed and built up to keep the suspense going and the reader turning the pages at a hellish speed. You'll fall in love with the world, with the characters and with Maas' style itself! I cannot express just how much I which I had picked up these books sooner! It really was such an epic read! I am currently reading the second book in the series, Crown of Midnight, and I didn't think it was possible for it to be even better than Throne of Glass, but so far I have been proved wrong! Look out for my review for that one soon! I cannot wait to bet caught up with this series, although I'm dreading it too because then I have to wait like everyone else for the next book and I'm so impatient! Haha!